Upsetting the odds the previous day, attracting the attention with their uninhibited skills, Japan’s Yukiya Uda and Masaki Takami continued their progress in the Men’s Singles event at the 2017 ITTF Challenge Belgium Open De Haan on Friday 3rd November. Both emerged successful in the third round encounters; arguably 16 year old Yukiya Uda progressed as expected, not 18 years of age Masaki Takami, he caused a major upset. Yukiya Uda beat fellow qualifier Switzerland’s Lionel Weber (15-13, 7-11, 11-7, 11-5, 11-4); presently on the Men’s World Rankings, Yukiya Uda is listed at no.220, Lionel Weber at no.270. Rather more significantly, Masaki Takami, likewise required to compete in the qualification tournament, stunned. He accounted for Germany’s Benedikt Duda, the no.4 seed (11-9, 11-9, 5-11, 4-11, 11-2, 11-8). One upset and as play progressed in the third round of the Men’s Singles event, there was one more surprise outcome. India’s Sanil Shetty, the no.23 seed, accounted for Chinese Taipei’s Liao Cheng-Ting, the no.9 seed and the player who had been so impressive at the Seamaster 2016 ITTF World Tour Grand Finals in Doha, when he had won the Under 21 Men’s Singles title. Focused, Sanil Shetty emerged successful in five games (8-11, 11-9, 12-10, 11-7, 11-7). Two surprises but in the remaining third round contests it was progress as predicted with, despite the defeat experienced by Benedikt Duda, German heads held high. Ricardo Walther, the no.2 seed, beat Sweden’s Viktor Brodd, the no.26 seed (11-8, 15-13, 11-6, 10-12, 11-7), Patrick Franziska, the no.5 seed, ended the progress of Hong Kong’s Ng Pak Nam, the no.22 seed (11-7, 11-1, 7-11, 11-9, 11-8). Defeat for Sweden but there was success; Simon Ardvisson, the no.24 seed, ended the advance of Hungarian qualifier, Bence Majoros (8-11, 12-10, 11-9, 11-6, 11-8). The end of the road for one qualifier, there was also defeat for another; Paraguay’s Marcelo Aguirre was beaten by Slovenia’s Darko Jorgic, the no.20 seed (5-11, 11-5, 5-11, 11-8, 11-5, 11-9). Success for Darko Jorgic as his status advised; in the one remaining third round Men’s Singles engagement the outcome was similar. 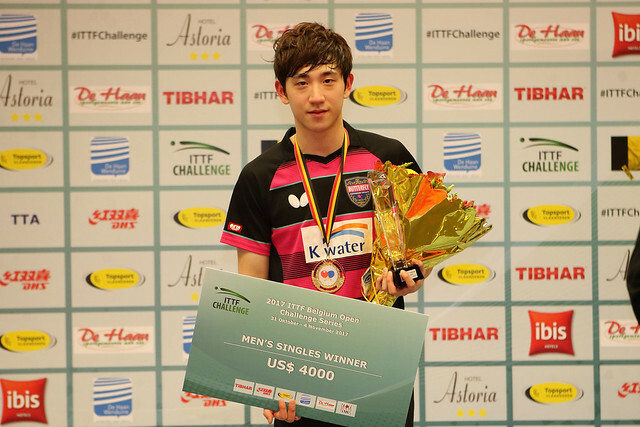 Korea’s Kim Donghyun, the no.8 seed, overcame England’s Sam Walker, the no.14 seed (9-11, 11-8, 12-10, 11-5, 13-11). In the round of the last eight, in the top half of the draw Yukiya Uda meets Patrick Franziska, Simon Ardvisson confronts Masaki Takami; in the lower half Darko Jorgic opposes Kim Dinghyun, Sanil Shetty plays Ricardo Walther.